How I get with a ferry from the port in Naples (Napoli) to the islands Capri and Ischia? Can I reach also the Amalfi Coast by ferry? Where can I buy the tickets and how much do they cost? Where I find the time table for ferries and hydrofoils? In our FAQ , you will find all answers about ferry transport in Naples and the Harbour. From Naples in Italy you can make excursions and tours with a ferry to many destinations. 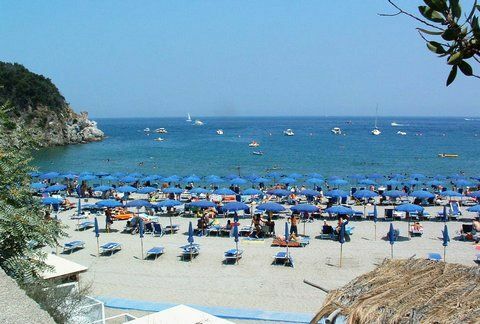 The prefered destinations of visitors are the islands Capri, Ischia and Procida in the gulf of Naples. 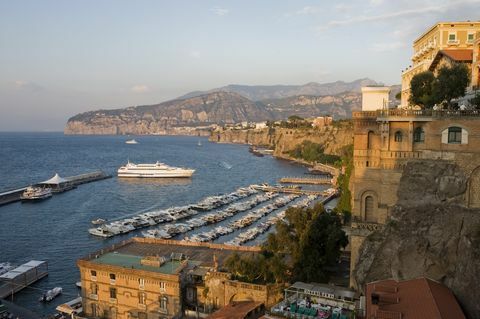 But it is also possible to reach the Amalfi Coast and Sorrento “via mare” by ferry. What types of ships are there? 1. ferry and car ferries (Traghetti): cheap and comfortable. 2. faster ships (Aliscafi = hydrofoil, catamaran and jets): faster, but also more expensive than a ferry. Where is the departure of ferries in Naples? The largest port facility in Naples is Porto di Napoli. Its piers include Porto di Massa, Molo Angioino and Molo Beverello. 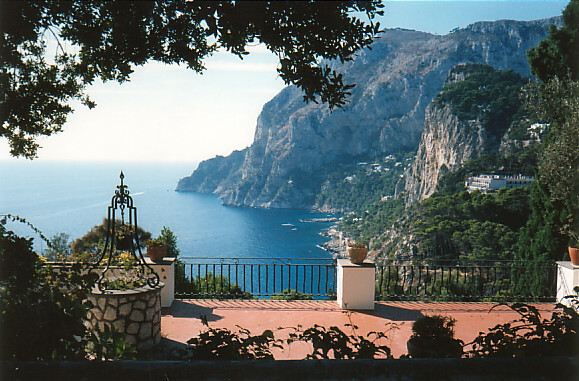 From there, ferries to Ischia, Capri and Sorrento. Porto di Napoli is also the contact point for cruise ships and ferries to many destinations in the Mediterranean. The second, much smaller port of Naples, called Porto di Mergellina. From there you can reach Ischia with the Aliscafo (only passengers). The small tourist Harbour also has an area for yachts. Also take ferries from Pozzuoli to the Islands. 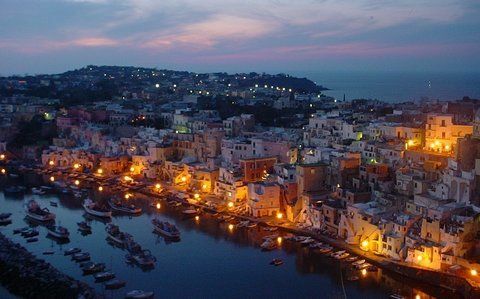 Procida is the fastest to reach from there, however the town of Pozzuoli is located about 20 km from Napoli. 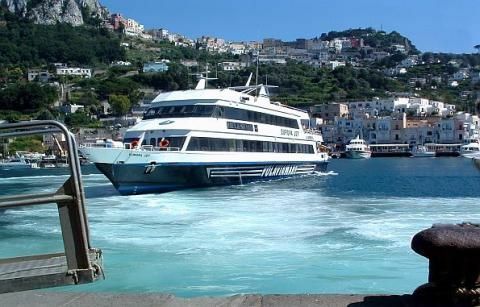 How much is the ferry transport to the Islands Capri, Ischia and Procida? The journey from Naples to Ischia, Procida and Capri with a ferry from Naples prices cheaper than with a hydrofoil. A ferry ride lasts but slightly longer. Ferry, apart from the price advantage: there is outdoor seating and you can enjoy the ride when the weather outside. Also good for taking pictures! The below prices are only approximate and depending on the company, travel time and type of ferry. There are ferries with no car transportation. One-way with a ferry or a hydrofoil Napoli Ischia or Capri is €11- €16. Naples – Procida will cost from about €13. If you go from the port of Pozzuoli to Procida, the ride is cheaper (from 8 euro). Here you can see prices. Where to buy tickets for ferries and hydrofoils? Tickets can be purchased directly at the counters of the respective port. Alternatively, you can book the ferry tickets online and securing a place without queues. The ticket will be sent to you by email. You will get also information about ferries and hydrofoils, timetable, price, and availability of any ferry company.